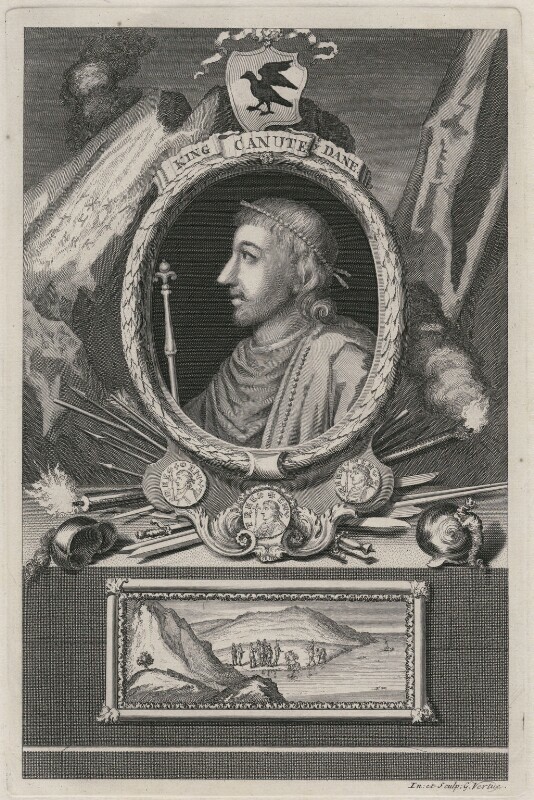 Canute or Cnut 'the Great' (994?-1035), King of Denmark and of Norway, King of England 1018-1035. Sitter associated with 8 portraits. Secession Church formed in Scotland. Widespread fraud and abuses in the customs service revealed. Prime Minister Robert Walpole responds with the Excise scheme, under which the tariff on wine and tobacco is to be replaced by an excise tax. British Hat Act limits manufacturing in the British colonies, forcing colonists to buy imported British-made goods. Frederick, Prince of Wales attends a fancy-dress ball at Vauxhall Gardens, initiating its supremacy as London's most fashionable meeting place. William Hogarth produces the first prints of A Harlot's Progress, having completed the painted series the previous year. The original Covent Garden Theatre Royal (now the Royal Opera House) opens. Austrian composer Franz Joseph Haydn is born. Georgia in the American colonies is granted to a group of British philanthropists, to give debtors a new start in life.